Here’s a good place to start. This is Harper Goff himself, creator of all those cool designs we love so much, standing on the full-sized NAUTILUS deck set. (She looks like she’s riding high in a sea of cement, eh?) The mockup was made primarily of wood, and also of a substance that was very new at the time: fiberglass. And here’s a view of the NAUTILUS deck in the outdoor wet set known as “Fox Lake”. This is where scenes like the deck sequences for the cannibal attack were filmed. 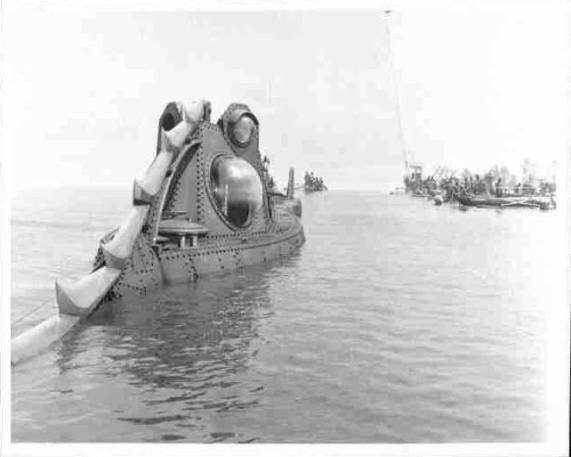 Speaking of the cannibal attack, here’s a look at the NAUTILUS on Fox Lake at the time they were filming those scenes. Notice that there’s no lens in the starboard headlight? I’d bet there’s no starboard viewport installed, either. Maybe because they wouldn’t be showing in these scenes, and Disney didn’t want to take a chance on them getting banged up, perhaps? Here’s a long shot of the Fox Lake wet set. Really pretty awesome, isn’t it? Notice the backdrops on the far side of the lake? All that stuff was painted to look like scenery: natural sky or whatever. Pretty amazing. Well, I seem to be focusing on images of the full sized NAUTILUS deck set, so I’m going to run with it. 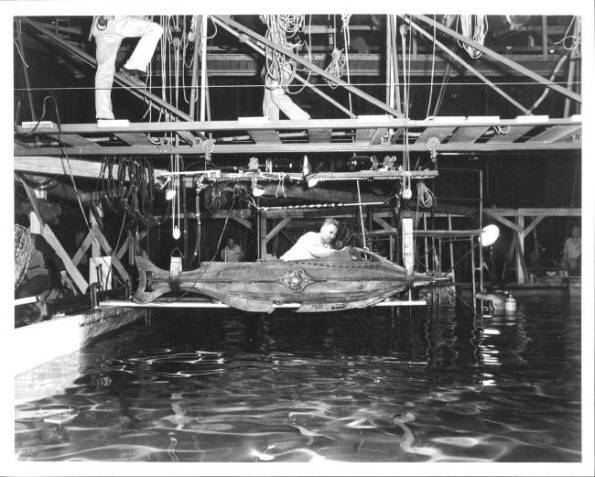 Here’s another look at the sub in the water: but this time it’s inside the specially constructed studio wet set where the ill-fated “sunset squid fight” and vastly superior “storm squid fight” sequences were filmed. Check out the fans in the right foreground: they are powered by airplane engines! One can only imagine what it must have been like to be inside there with those things running, waves being kicked up, rain in the air…it must have been like being in a real storm. Here’s another look at the indoor wet set, but this time seen from the opposite angle. 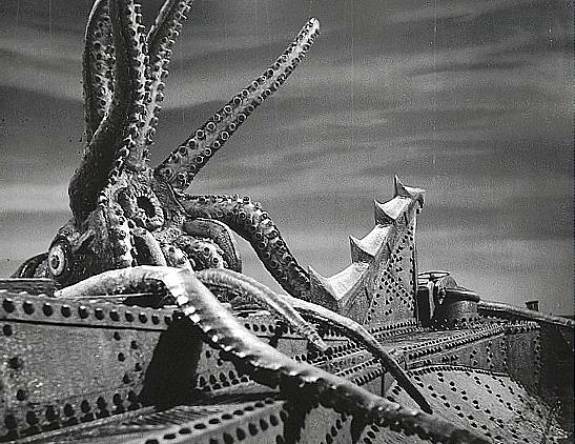 From the position and configuration of the squid, it looks like this was taken after the “sunset squid fight” sequence bit the dust, and the storm sequence was being prepared. Speaking of the sunset squid fight, here’s a look at the deck set with the monster in place. 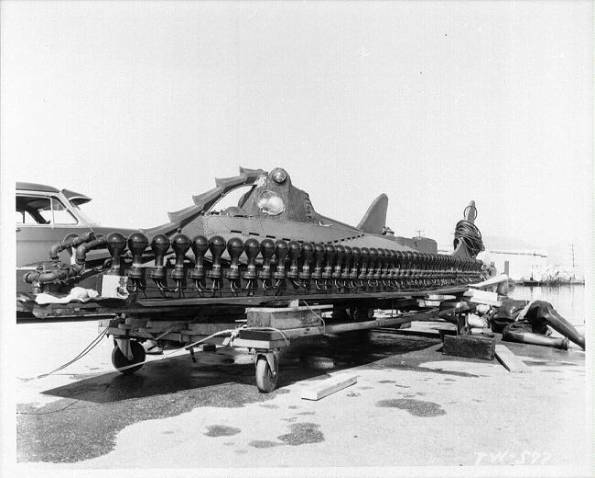 Look closely and you can see the wires holding up the beast’s tentacles. Pretty lame. Disney was right to dump this turkey and go the whole nine yards to film this sequence in a raging storm. If this footage had made it to the theater, it would have sunk the entire show. For an excellent insight to the various aspects of the sunset squid fight, see Larry Brooks’ article in the June ’03 CINEFANTASTIQUE magazine. OK, one more picture, and then I’ll close out what seems to have become a section devoted to BTS shots of the full-sized deck set. Actually, this looks like a cut scene of Nemo and the Professor rowing ashore on the prison island of Rorapandi. I’ve seen it printed in reverse of this view, but the ID number at the lower left of the frame says this is how Disney wanted it, so that’s how we’re showing it here. 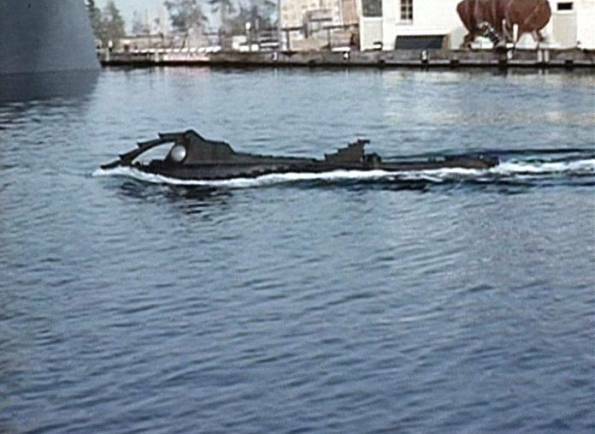 Any way you look at it, this is a great view of the submarine on the surface (again shot at Fox Lake). Well, I think that’s about all I’m going to do on the 1:1 deck set for now. 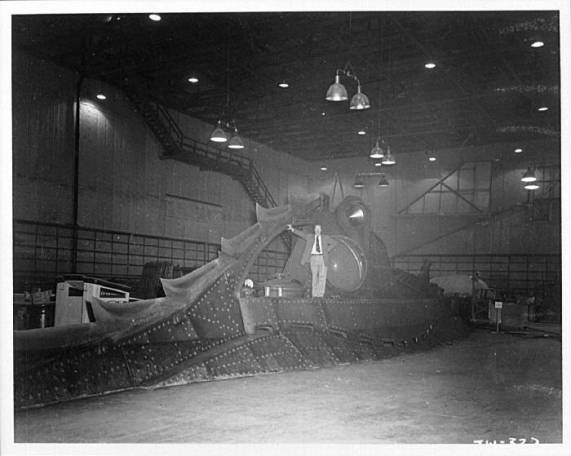 Next, since we’re focused on the NAUTILUS and water, I’ll be adding scenes of the 20-foot trolley-mounted waterline model used in the attack and surface running scenes; and also images of the 11-foot special effects model used in the underwater scenes where the entire sub is visible. Until next time: enjoy! This is the vaunted 11-footer on the job, hanging in slings that were used to lower and raise it in and out of the tank where it was filmed. 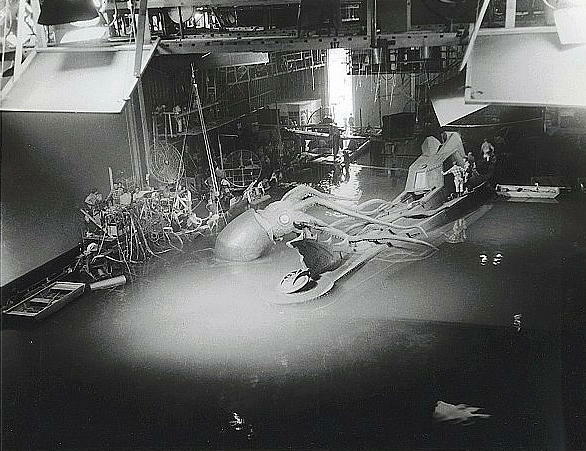 In the background, to the right of the ramming spur, you can see a SCUBA diver in the pool: apparently one of the underwater members of the film crew. Here’s a look at the 22-foot waterline model, mounted on a trolley with lights. 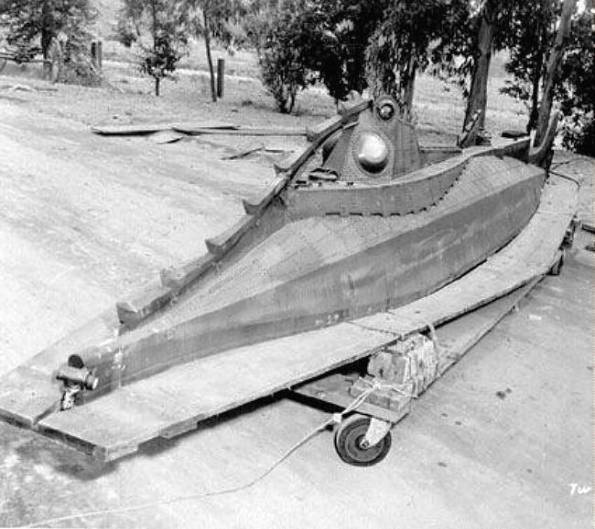 This unit was towed across Fox Lake to film scenes of the NAUTILUS running on the surface. 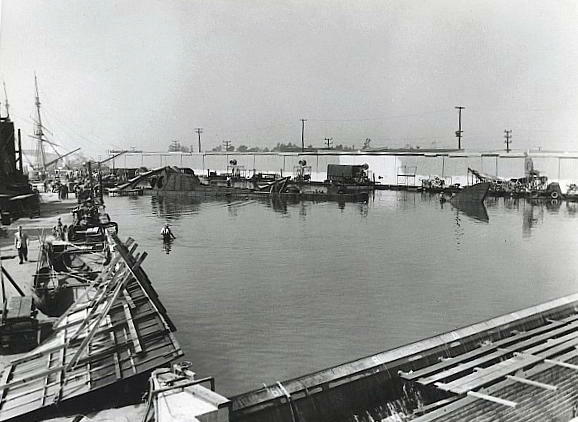 Remember the menacing green glow surrounding the sub during the scene where it rammed the ABRAHAM LINCOLN; and recall the vigorous bow wave washing over the wheelhouse as the sub charged into the attack? The glow was produced by the light array, and the bow wave was generated by the water canon visible at the very front of the trolley. 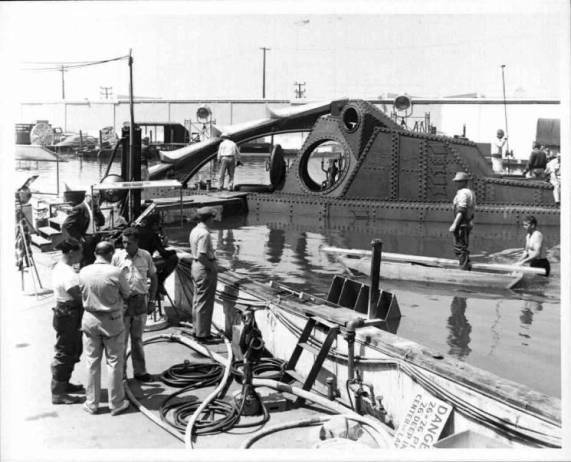 Laying below the tail fins, we can see a workman clad in rubber waders, making adjustments to the device. This is the 22-foot trolley model minus the lights and water canon. Compare this view to the one above: notice anything different? Check out the normal-sized tail fin (the one above is taller) and also the visible rakers on the dorsal fin. 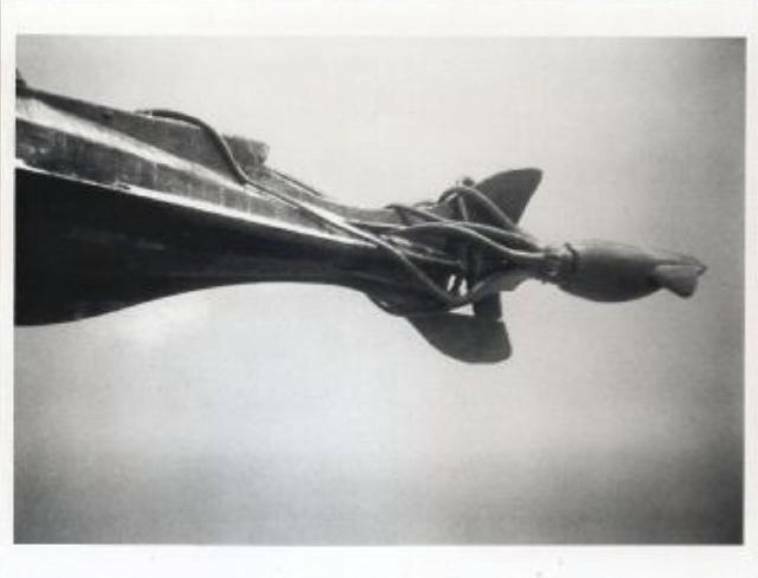 In some cut scenes of the sequence where the GOLDEN ARROW is rammed, we can see the NAUTILUS has a more pronounced tail fin. 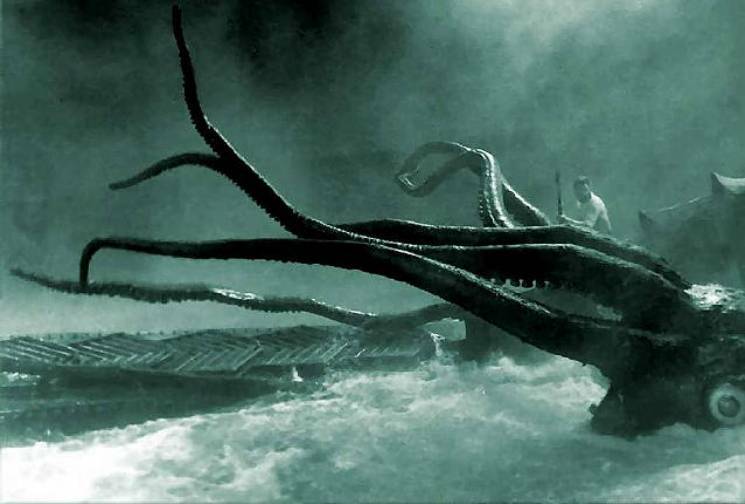 There were also cut scenes where the model was draped with fake seaweed, to make it harder to distinguish as a vessel and make it look more like a sea monster. Possibly, by the time the picture at left was taken, the crew was past that point in the picture. To me, this looks like it could have been taken about the time they were filming the scene where the NAUTILUS surfaces, just prior to Ned throwing the message-bottles overboard. Ty Bumgardner sent in this screen capture from “The Making Of” Documentary, and it’s a great image of the 22-foot trolley model running along almost awash in Fox Lake. Man! I’ll bet those guys really had fun making this movie! Look at all the cool stuff they got to play with…and they got PAID for it! OK, no more limiting this page to certain subjects; now we’ll just start going random with BTS images from the making of the movie. 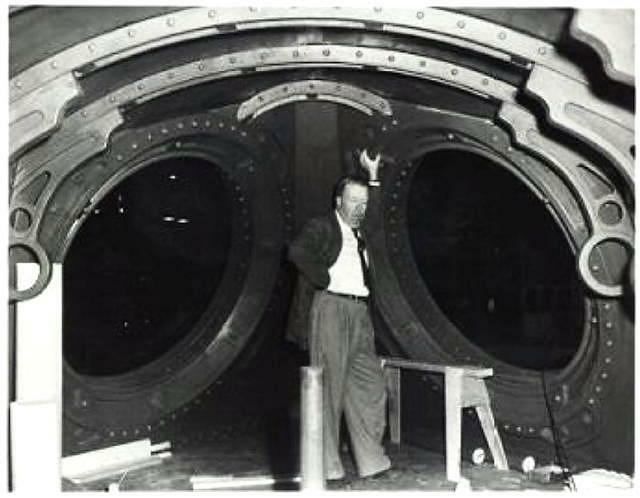 Here's Production Designer HARPER GOFF inside the wheelhouse while it was under construction. 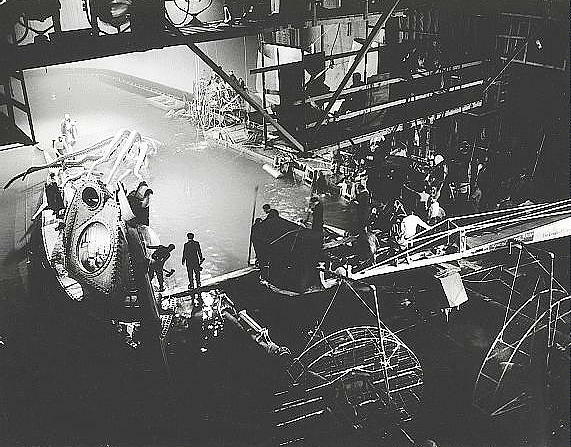 20,000 LEAGUES was one of the first movies to use a new material in set design: much of this set is composed of fiberglass. 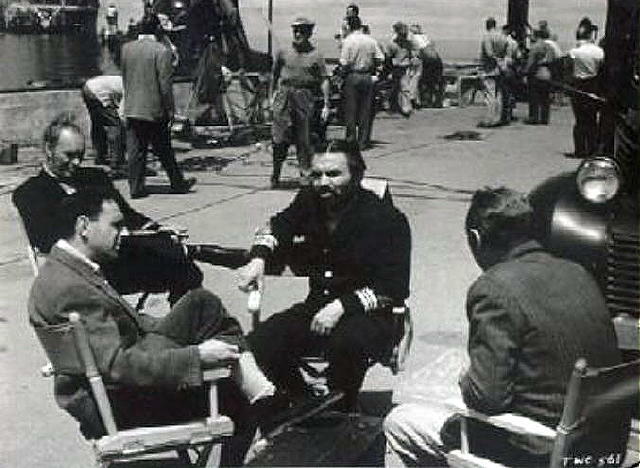 From left to right: Robert Wilke, Richard Fleischer, James Mason, and Paul Lucas seem to be discussing an aspect of the movie during a break in filming at the Fox Lake wet set. 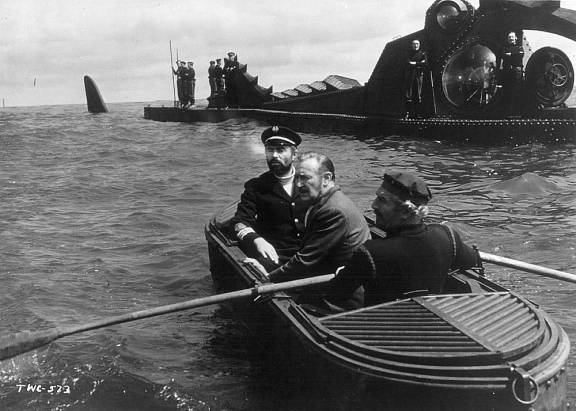 Judging from their costumes, this could have been on the day they were shooting the scene where Nemo and Arronax have returned from Rorapandi, and the NAUTILUS is about to sink the nitrate ship. Here’s a look at the USS ABRAHAM LINCOLN’s exterior hull set. 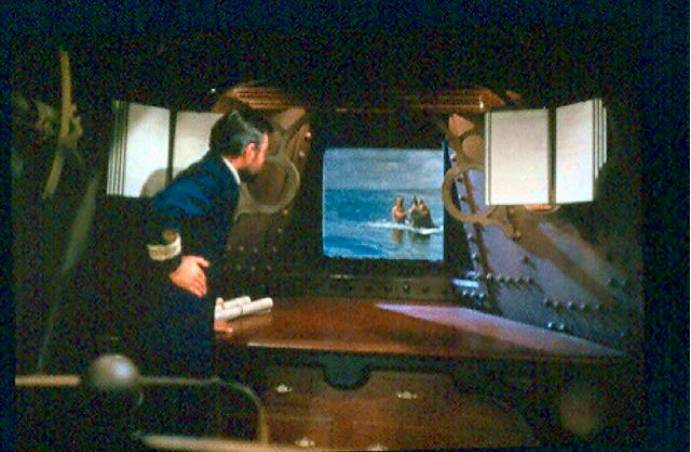 James Mason as Captain Nemo in the wheelhouse set as the footage of Ned, Conseil, and Professor Arronax awash on the aft deck of the NAUTILUS is played on a rear-projection screen located just outside the back window. 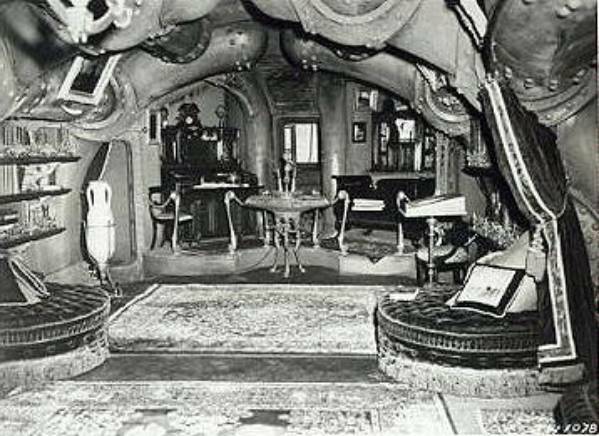 Here’s a look at the NAUTILUS salon from a seldom seen angle. 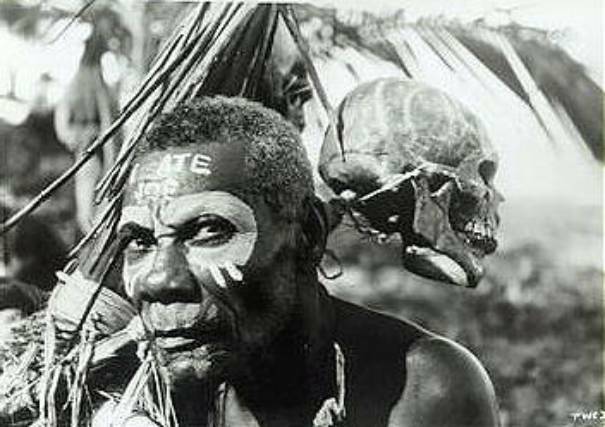 If you saw the “Making Of” documentary on the DVD, you heard Richard Fleischer speak of the two native cannibal actors who had written “Eat at Joe’s” and “I Ate Joe” in their warpaint. Here’s a candid look at the apparently satisfied diner. 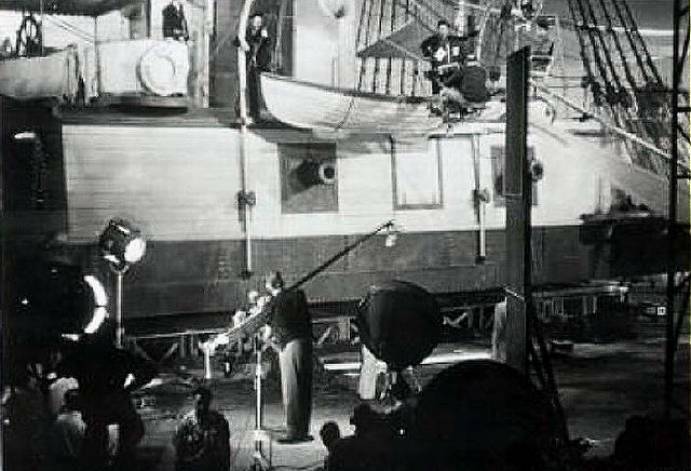 Here’s a test shot taken while they were figuring out how to film Nemo’s entry into the diving chamber. In this sequence, they didn’t use the overhead grab bar to lift the diver out of the water. 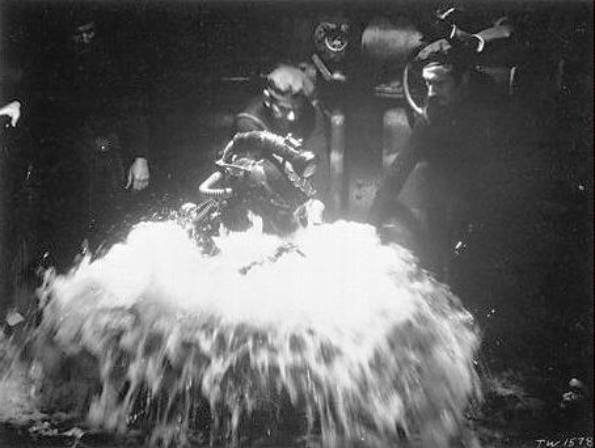 Also, the surge of foam is produced by a SCUBA diver below the set, directing the discharge from a firehose up into the diving hatch. And here’s a scene from the movie showing how they finally decided to perform the stunt. 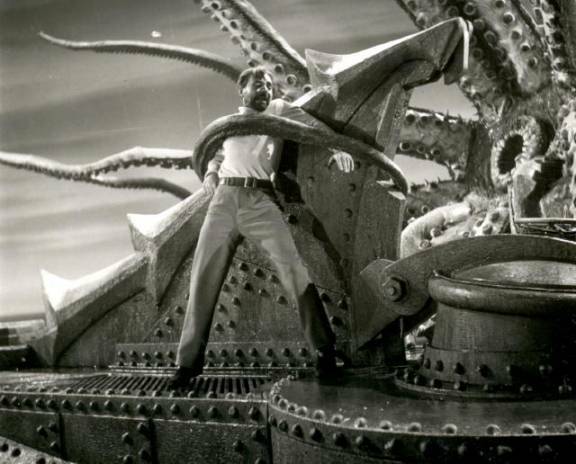 A candid shot of the scene where James Mason enters the Nautilus. 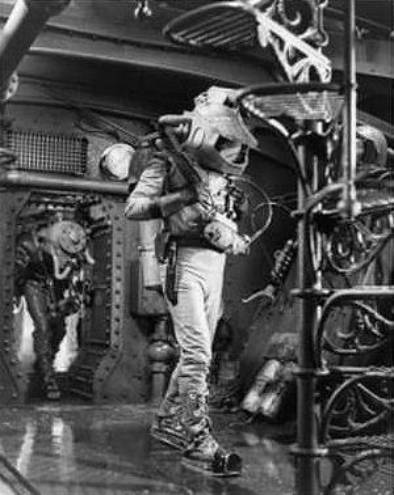 Note that he’s wearing the fiberglass “stunt helmet” rather than the heavy metal diving helmet we see in the actual underwater scenes (no doubt for practical reasons). And here’s a screen grab of the above scene as it looked in the movie. 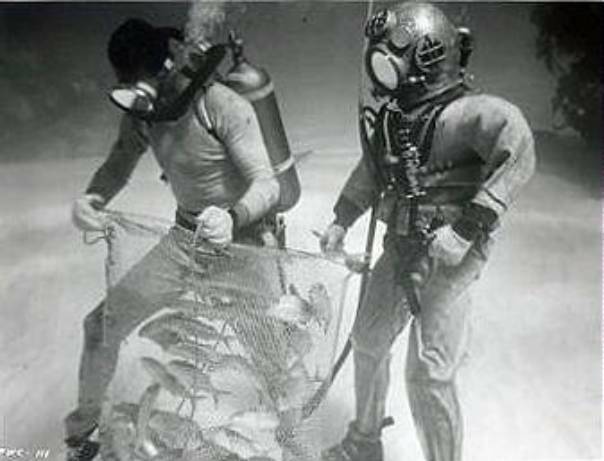 In the Bahamas, the safety diver in MkV hardhat gear stands by a fish wrangler in conventional SCUBA. 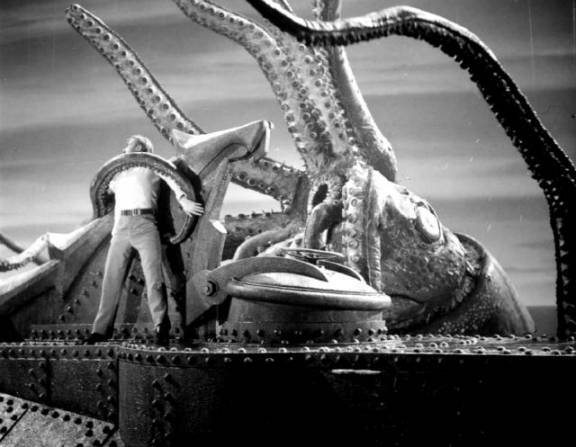 Here’s a black and white shot of the miniature squid attacking the 11-foot SFX model NAUTILUS. And here’s an excellent view of the storm squid fight sequence provided by Larry Brooks. NEW! More stills from LEAGUES Historian Larry Brooks. This time it’s about Larry’s favorite subject, the infamous Sunset Squid Fight. Larry informs us these images are previously unpublished and hopes you will enjoy seeing them. Thanks, Larry!